The U.N. refugee agency says it has been forced to suspend a distribution of aid to displaced people in the eastern Democratic Republic of Congo's North Kivu province because of renewed violence. Lisa Schlein reports for VOA from Geneva that the UNHCR says the suspension is only temporary and will be lifted as soon as possible. The U.N. refugee agency reports hundreds of people have fled fighting in the Rutshuru area of North Kivu since the clashes began last weekend. The agency says it halted distribution of aid to displaced people amid reports of new fighting Thursday between government soldiers and fighters from the rebel Democratic Forces for the Liberation of Rwanda movement. UNHCR Spokesman, Ron Redmond tells VOA the agency also has suspended the registration of new arrivals at campsites for internally displaced people in the Rutshuru area. "We do not think it is going to last," he said. "But, it happens fairly often in an environment like that, where you have got armed groups sort of wandering the countryside, pillaging villages, blocking roads. It is just a dangerous environment in which to work. So, it is just a temporary shut down." Redmond says UNHCR staff visited sites for internally displaced people following the first outbreak of violence and exodus of people. He says the aid workers went to the area to find out more about the attacks and to assess the needs of the displaced. He says there is not enough shelter to accommodate the new arrivals, so most are staying in public buildings. He says they have been receiving food from people displaced in earlier waves of violence. Redmond says most of the people turning up at the displacement camps are women and children. He says most have harrowing tales to relate. "Many of them said their homes were destroyed, their possessions looted," he said. "Others had lost touch with their children. They were unable to find them. We know in the past, in some cases, children had been taken away by these groups. There has also been a lot of sexual and gender based violence in the Kivus, which is a huge, huge problem. Our staff is saying that medical assistance is urgently needed amid fears of a cholera outbreak. So, the sanitation conditions are very bad in some of these areas as well." 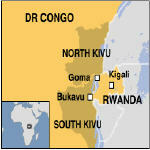 Fighting between the government and rebel groups in eastern Congo has been going on for over a decade. The recent displacement in the Rutshuru area comes three months after the government and armed groups signed an agreement in Goma to end the war. International and Congolese human rights groups warn little progress has been made toward a last peace. There are an estimated 1.3 million people displaced within the country, and 350,000 Congolese have sought refuge abroad.